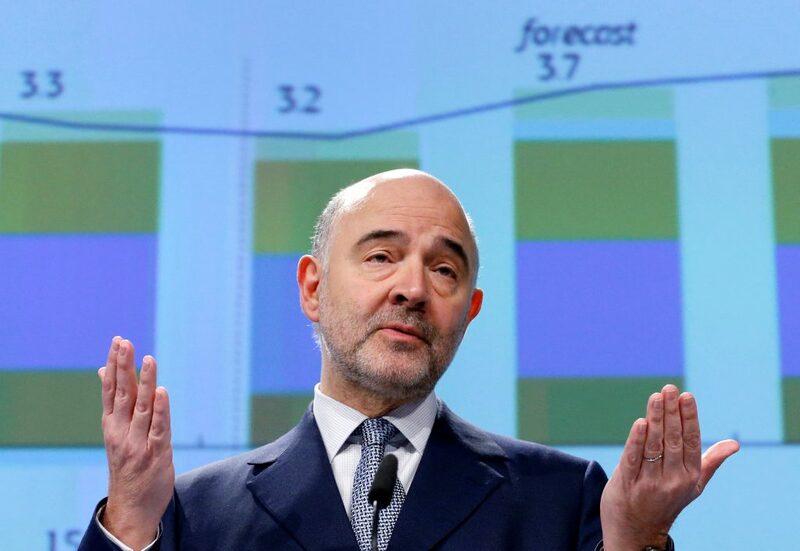 The European Commission said on Monday that uncertainty about U.S. policies, Brexit and elections in Germany and France would take their toll on the eurozone economy this year. It forecast eurozone economic growth to lose some speed this year before rebounding in 2018. It saw a sharp growth drop ahead in non-eurozone and EU-leaver Britain. The British economy will nearly halve its expansion by 2018, the European Union executive said in a broad series of economic forecasts. Growth in the 19 countries sharing the euro would slow to 1.6 percent this year from 1.7 percent in 2016, but would gain speed in 2018 when the bloc’s gross domestic product (GDP) is expected to increase by 1.8 percent. Germany, the bloc’s leading economy by far, is expected to see its GDP growth slow to 1.6 percent this year from 1.9 percent in 2016. Growth will accelerate from 1.2 percent to 1.4 percent in France, and remain stable at 0.9 percent in Italy. Despite the slowdown from 2016, the eurozone growth forecasts were slightly revised up for this year and 2018 from the Commission’s previous estimates released in November. Then, eurozone GDP was estimated to grow 1.5 percent this year and 1.7 percent in 2018. The “still-to-be-clarified” intentions of President Donald Trump in “key policy areas” are seen as the first cause of uncertainty for the bloc’s economy. In the near term, the possible package of U.S. fiscal stimulus “could provide a stronger boost to global GDP than currently expected,” the Commission said. However, in the medium term, “potential disruptions associated with shifting U.S. positions on trade policy could damage international trade,” it said. The Commission is also waiting for clarifications from the Trump administration on banking regulation, tax and fiscal cooperation, Pierre Moscovici, the economics commissioner, told a news conference. The European Union will face other political risks caused by divorce negotiations with Britain, likely to begin in March, and elections in several EU countries this year, including Germany and France, the Commission said. Britain is expected to pay a higher cost for the political uncertainty surrounding Brexit talks. Its GDP growth is forecast to decline from 2.0 percent in 2016 to 1.5 percent this year, and to further slow down to 1.2 percent next year. Britain’s “business investment is likely to be adversely affected by persisting uncertainty while private consumption growth is projected to weaken as growth in real disposable income declines,” the Commission said. The British unemployment rate is seen rising slightly to 5.6 percent in 2018 from 4.9 percent last year, while inflation will increase steeply to 2.5 percent this year and 2.6 percent in 2018. The gloomy forecasts on the British economic growth are, however, better than previously estimated by the Commission which had predicted in November Britain would grow 1.9 percent last year and only 1.0 percent this year. The 2018 forecast is unchanged. Consumer prices in the eurozone are forecast to markedly pick up this year, as inflation will surge by 1.7 percent from 0.2 percent last year. The 2017 estimate is higher than the 1.4 percent inflation growth predicted by the Commission in November. The European Central Bank predicted in December inflation would grow 1.3 percent this year. But eurozone inflation is expected to slow again in 2018 to 1.4 percent and core inflation, which excludes more volatile prices, is set to rise only gradually. This is still “short” of the ECB’s target of an inflation “below, but close to 2 percent,” the Commission said. However, this is not seen as sufficient to keep the ECB’s stimulus plan to continue indefinitely. “With inflation picking up from low levels, we cannot expect current monetary stimulus to last forever,” the Commission’s vice president Valdis Dombrovskis said, urging eurozone states to continue structural reforms.